How many times have you attended an event just for the food? It doesn’t even matter if you have to pay for it or not. Luckily, if you’re attending a formal gathering, the event is fully catered so you don’t have to worry about how much food you’re consuming throughout the night. Catching up with friends and having social engagements with other party-goers might have played a part in making the final decision, but it’s hard not to see food as the primary motivator to get dress and leave the four walls of your room. But before we get to the chance to enjoy our favorite plate of lasagna, we have to make an order. Restaurants typically have a menu ready to showcase their offered items. This serves as an introduction to the business, more as an advertising tool that markets products for consumers to purchase. 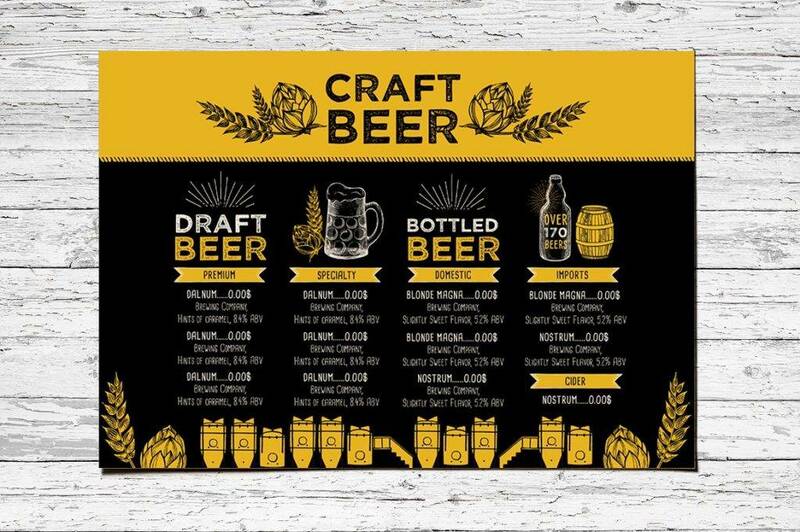 With a menu design, it’s more than just what you have and the price is set for these items, as the overall menu structure can leave an impression on your audience. With that in mind, it’s essential to design a menu that could leave a lasting impact, and effectively serve its desired purpose as well. The catering business is relatively huge in the market, with its convenient services and affordable prices attracting the average consumers at a fast pace. However, it can also be a broad industry, where businesses vary in nature. That being said, it’s important for entrepreneurs to be aware of what type of menu design would best fit their business. 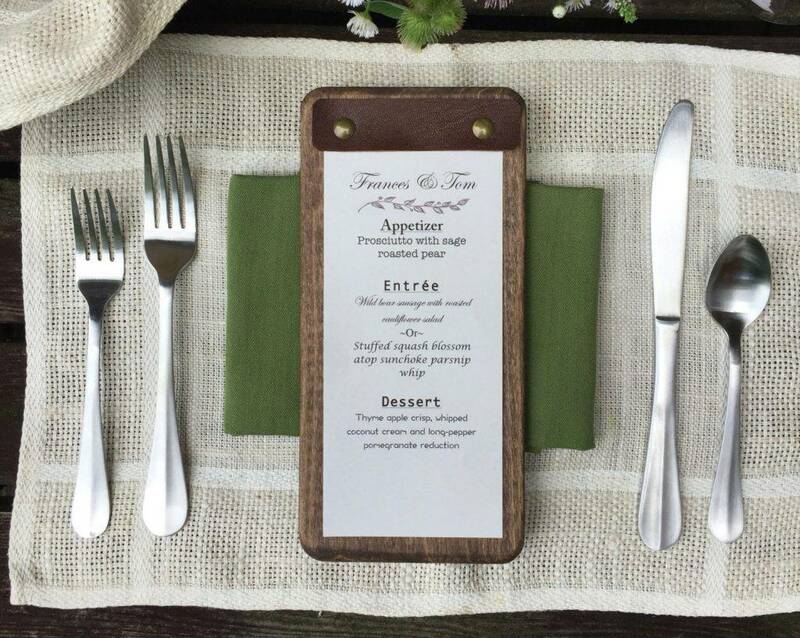 Menu cards are perfect for catered events for a number of reasons. 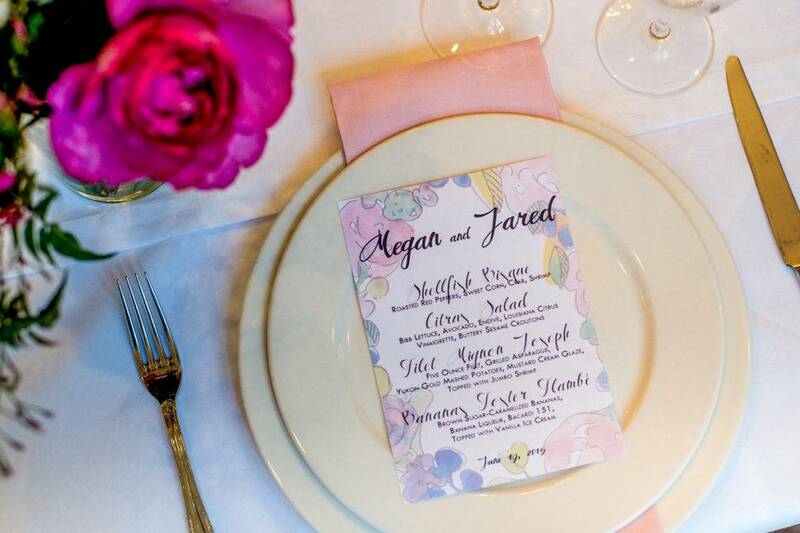 For one thing, a menu card sits well with every other design element in a sit-down dinner, such as the flower arrangement and the table setting. 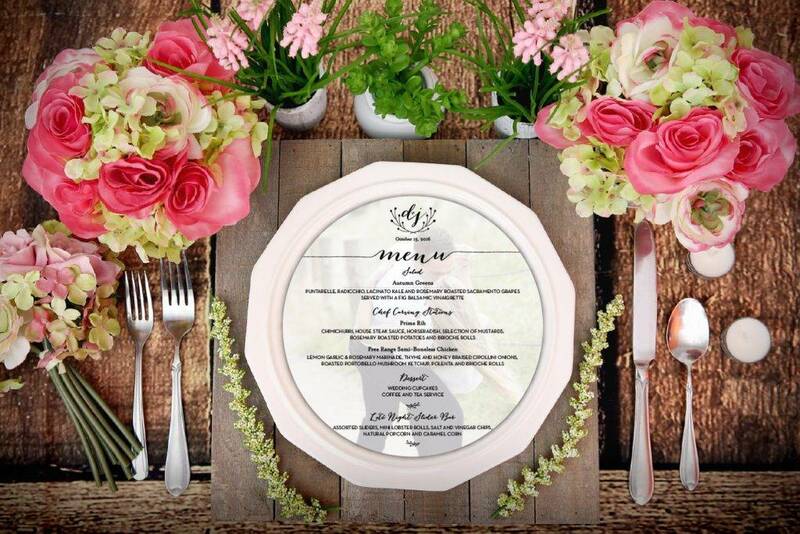 Since most formal gatherings hire catering services to prepare their reception, wedding menus and cocktail menus may fall under the catering menu category. 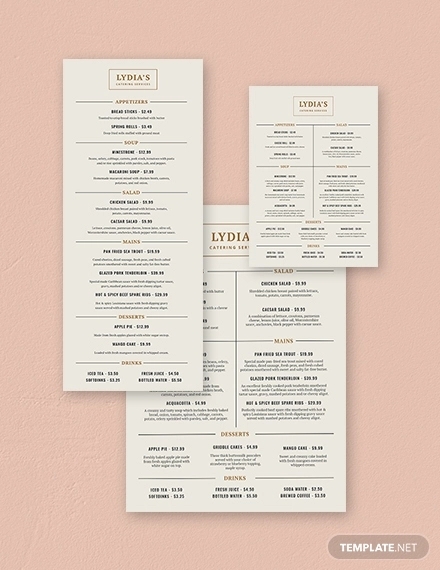 These menus may either be printed on a special type of paper or a thin card. They are also quite handy to carry around, not to mention how easy and affordable it is to produce. A lot of fast-food joints use large menu boards to entice customers. Its blown-up display and bright colors may easily turn heads every time. 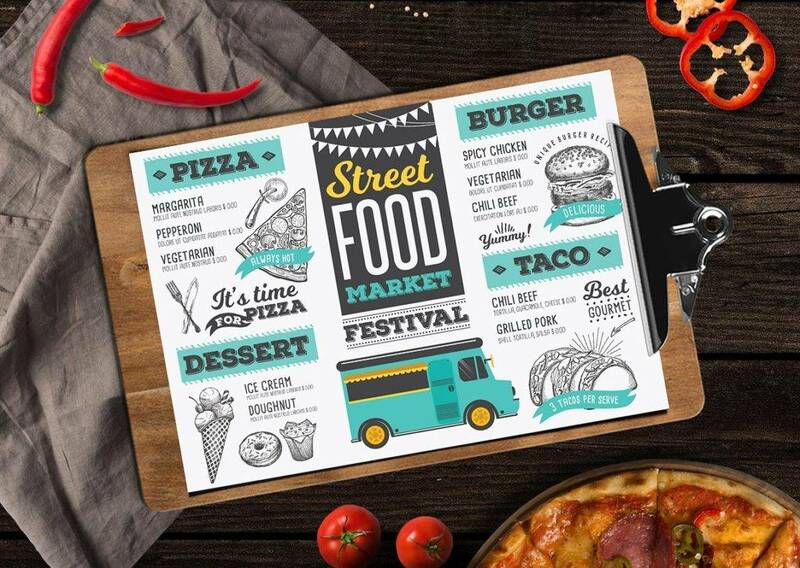 While menu boards aren’t common among indoor celebrations and events, they are still highly utilized by food stalls and food trucks alike. 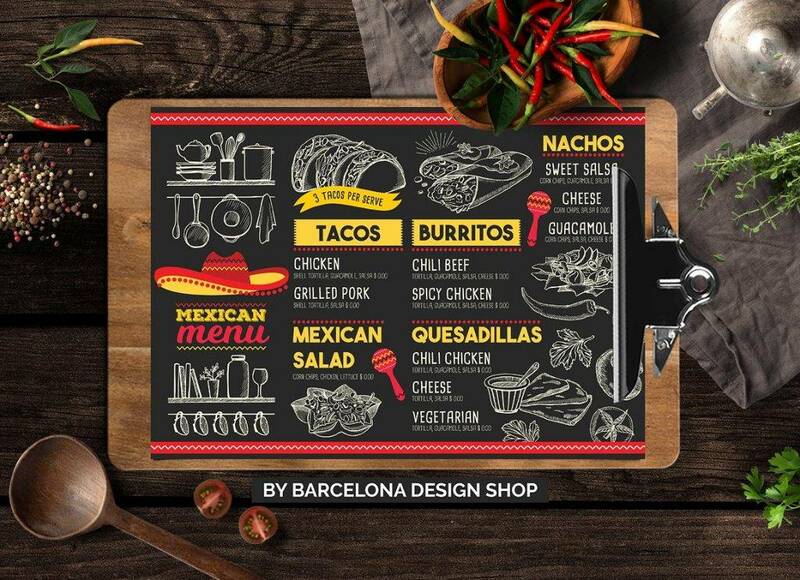 But because these types of businesses only serve specific goods to their audience, menu items are often limited, leaving enough space for images and other graphics. Outdoor signs are a lot like menu boards except for how they are used, as they are specifically made for open-air activities. Most outdoor signs are used for catering events that are more on the extravagant side than usual, as the items on the menu have already been planned and settled by the event hosts and caterers. 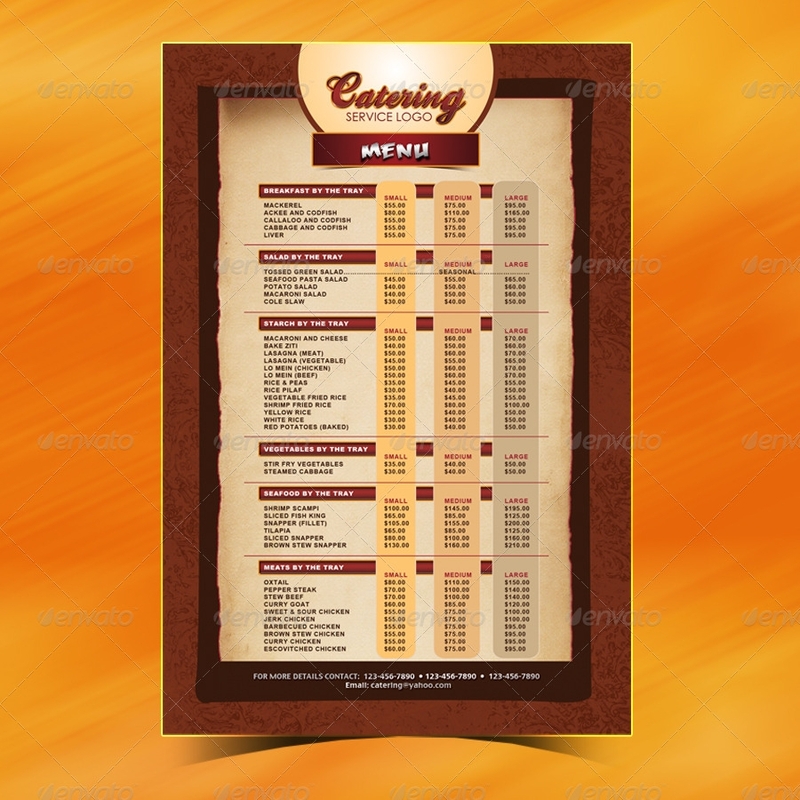 This type of menu may even be used by restaurants and cafés to lure in potential customers. A chalkboard menu is an ideal material for this, as the content of the menu may easily be altered whenever necessary. However, only a limited number of items may be listed due to the size of the signboard and its readability. Although having a menu that could attract an audience is what we aim for, you have to remember one of the most important attributes of a menu design: its readability. Pictures and other graphic elements may easily draw attention towards your menu, but if a viewer finds it difficult to grasp, then your menu has failed to deliver its intended purpose. Let’s be honest, it’s hard to imagine a menu board displaying items in a 12pt. font size. Knowing this, you need to choose a typeface that is both attractive and readable. The type must coincide with the theme of your menu, along with the message you want to convey. For instance, party menus tend to be more festive, so you could always choose a font that gives off a fun and enthusiastic vibe. As for formal sit-downs, you might want to consider calligraphy for an elegant typeface. When eating at a restaurant, you’d want to devour your meal without any problems running through your mind. But that can be quite difficult to do, especially if you feel conscious about how much you’re spending for each order. Although it wouldn’t be right to catch your customers off-guard with a jaw-dropping restaurant bill, you wouldn’t want them to feel intimidated by your price list either. To make a menu that won’t scare off customers, you’d need to focus on the way you present your prices. Try not to add any more weight to the numbers by steering clear of currency signs and bold text. This will make the price seem lesser than it actually is, which can greatly impact a customer’s decision. These days, restaurants like to focus on the number of dishes they are able to offer, without even considering the presentation of these items. You see, reading a menu is quite similar to reading a book. If the menu is too thick for one to fully take in within a minute or two, it can be quite overwhelming for one to scan through. So instead of making a menu that’s as thick as a 10-page catalog, you might want to make everything appear visible in one look. This will prevent your customers from making spontaneous decisions over just-for-the-sake-of-it orders that may not be what they were initially going for. Keep it as neat and as clean as possible. 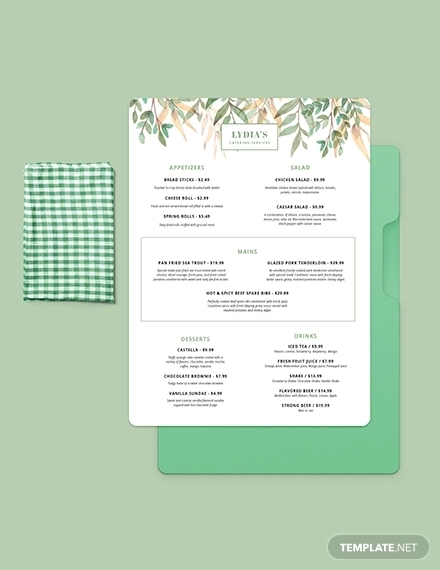 The overall layout might as well be the most important element of your menu, as this may affect how a person perceives your business as a whole. The content of your menu must be organized properly in such a way that maximizes white space accordingly. To do so, make sure every item in the menu, along with its corresponding price, is situated properly. Avoid overcrowding. If one page is not enough to display all your offerings, you could always utilize the opposite side to make a back-to-back menu as well. Arrange items strategically and logically. Most people like to read in a z-shaped pattern, starting from the top-left corner of a menu down to the bottom. Considering how some diners order a full course meal rather than just a single item from your menu, it might be necessary to arrange your menu items in a systematic flow. Not only will it be easier for customers to decide on what to order, but it can also help you emphasize certain menu items from each course. This can be a good marketing strategy, especially when you want to make sure your customers are satisfied with their orders. Insert special offers. A majority of restaurants have a completely set menu, where items are thoroughly thought of before they gain a spot as an official menu item. But having the same old menu can get boring sometimes, and diners are bound to get tired of having the same thing over again. When this happens, you’ll need to switch it up somehow to keep the hype alive. To do so, adding some specials to your menu can easily spark some curiosity. You can either insert a slide-on to your menu or make a separate menu for these offerings. Some coffee shops and small-scale restaurants even have their specials written on chalkboard menus for customers to see. Feed the imagination with excellent phrasing. It’s one thing to decorate your menu with colors and other design elements, but keeping it up a notch with good wording and a hint of wit is a whole other level of creativity that is sure to set you apart from the competition. Start by naming your dishes by its French or Italian terms, or you could think of something fun and out of the ordinary, and then add a short and precise description of the given dish. Focus on connecting with your audience in order to give your menu a twist that’s in line with its purpose yet relatable at the same time. Use premium quality graphics and photos. Adding a few images to your menu is a great way to stir up an appetite. Despite our natural pattern of reading a menu, elements such as the typeface, color, boxes, and images can affect the way we look at the menu. However, refrain from adding any blurred or grainy photos, as this can gain the opposite effect. It’s also important to use these images sparingly so as to not fill up the whole menu with a collage of pictures, and to leave enough space for other elements of the menu as well. 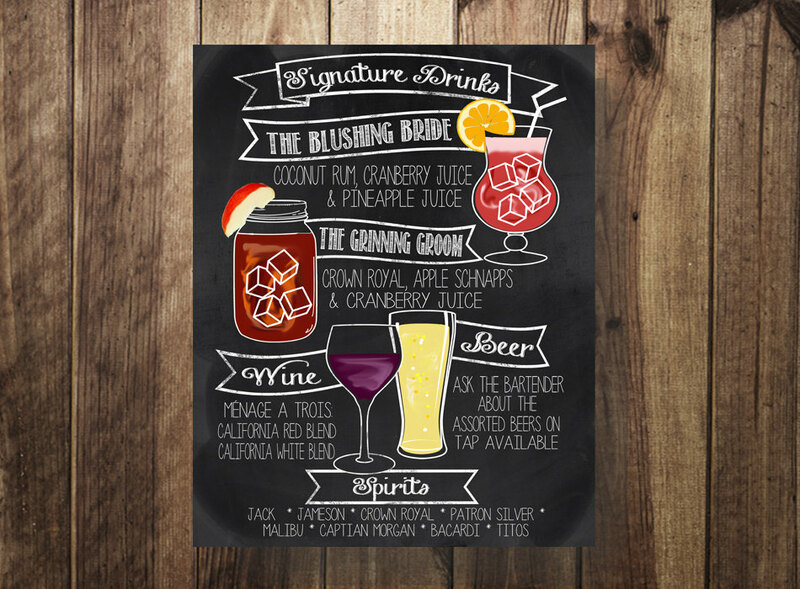 With all that has been said, it’s clear that the design of your menu can impact your business in various ways. 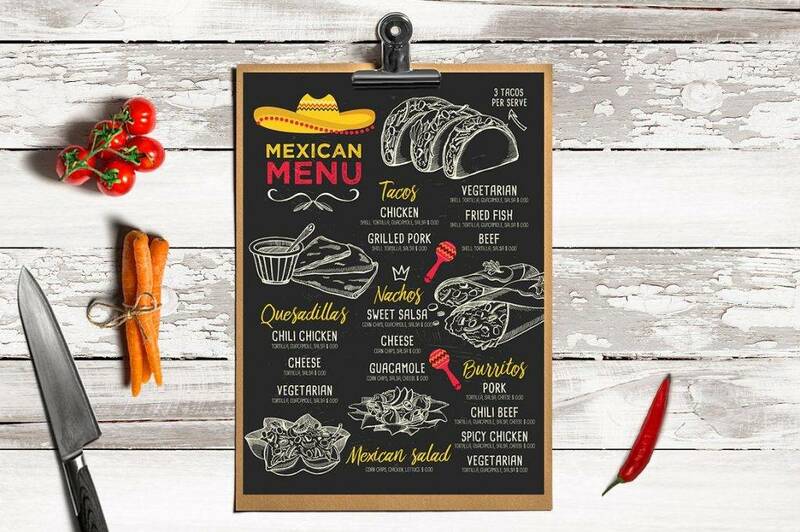 The process of designing your menu must be taken seriously, as this is one of the factors that helps build a bridge between you and your customers. So along with the treatment you give and the atmosphere you create, a well-made menu design may result in a better customer experience, a positive name for the restaurant, and a good profit for your business to prosper in the market.